Stem cell-powered implant set to revolutionise orthopaedic surgery. Scientists at the University of Glasgow are working to harness the regenerative power of stem cells to improve orthopaedic implant surgery. They are collaborating with surgeons at Glasgow’s Southern General Hospital to develop a new type of orthopaedic implant which could be considerably stronger and more long-lived than the current generation of products. Currently, implants are commonly made from materials such as polyethylene, stainless steel, titanium or ceramic and have a limited lifespan due to loosening, requiring replacement after 15 or 20 years of use. In hip replacement surgery, the head of the thigh bone is removed and replaced with an implant which is held in place by a rod fixed inside the marrow along the length of the bone. Marrow is a rich source of mesenchymal stem cells, which have the potential to divide, or ‘differentiate’, into other types of cells such as skin, muscle or bone which can improve the process of healing. 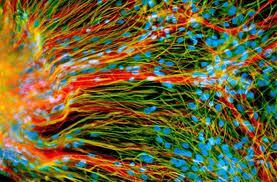 However, stem cells can also differentiate into cells which have no use in therapy. Artificially controlling the final outcome to ensure the desired type of cells are created is very difficult, even under laboratory conditions. When traditional implants are fixed into bone marrow, the marrow’s stem cells do not receive messages from the body to differentiate into bone cells, which would help create a stronger bond between the implant and the bone. Instead, they usually differentiate into a buildup of soft tissue which, combined with the natural loss of bone density which occurs as people age, can weaken the bond between the implant and the body. The team from the University of Glasgow’s Colleges of Science and Engineering and Medical, Veterinary and Life Sciences have found a reliable method to encourage bone cell growth around a new type of implant. The implant will be made of an advanced implantable polymer known as PEEK-OPTIMA, from Invibio Biomaterial Solutions, which is already commonly used in spinal and other orthopaedic procedures. Dr Matthew Dalby, of the University’s Institute of Molecular, Cell and Systems Biology, explained: “Last year, we developed a plastic surface which allowed a level of control over stem cell differentiation which was previously impossible. The surface, created at the University’s James Watt Nanofabrication Centre, is covered in tiny pits 120 nanometres across. When stem cells are placed onto the surface, they grow and spread across the pits in a way which ensures they differentiate into therapeutically useful cells. The team is supported by the UK biomaterial solutions provider Invibio, the world’s leading provider of PEEK-based materials. Dr Nikolaj Gadegaard, Senior Lecturer in Biomedical Engineering at the University, explained: “One of the main selling points of PEEK is that it is very strong, has excellent stability and is very resistant to wear. However, the inertness of the material is not always suitable for implants that require some interaction with the surrounding tissue. Our nanopatterned surface may allow Invibio’s PEEK polymer to interact with stem cells and enable an effective integration between the implant and the body for the first time. The partnership between the University’s academics and surgeons at the Southern General is a result of the Glasgow Orthopaedic Research Initiative (GLORI). GLORI, formed in 2009, aims to foster collaboration between scientists and clinicians to turn novel materials research into the next generation of orthopaedic care. Dominic Meek, Consultant in Orthopaedics and Trauma Surgery at Glasgow’s Southern General Hospital, has been participating in the development of the new implant. He said: “I originally began working with Dr Dalby and Dr Gadegaard to supply samples of bone marrow stem cells for their research but it quickly became clear that their work had a lot of potential for direct applications in my area of surgery. We’ve been working closely together ever since and we’ve created an enthusiasm for orthopaedic research in the west of Scotland which has been re-emerging over the last 15 years or more. Four postgraduate students have completed MDs or PhDs related to the subject and we currently have a team of six students, clinical fellows and post-doctoral researchers focusing on this new innovation. The research to date has been funded by the Biotechnology and Biological Sciences Research Council (BBSRC), the Medical Research Council (MRC), the Engineering and Physical Sciences Research Council (EPSRC), the Scottish Government’s Chief Scientist Office and the European FP7 project NaPANIL.